But if I can make my son's treats a bit healthier, I'm totally going to do that. Because, yeah, I'm that mom. So, when I went to this fun National Kale Day event and got to sample fujiKale, I was all over it. 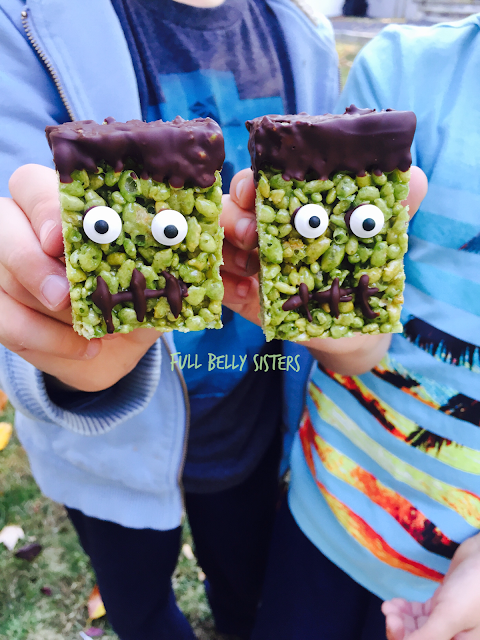 What a simple way to add some nutrition—as well as natural color—to a fun Halloween treat! Luckily, I got to take some fujiKale home so I could whip up treats to share with you all. fujiKale is 100% kale organically-grown in Japan, free of chemical pesticides and fertilizers. It is USDA Certified Organic and provides vitamins A, B, C, K and calcium. It's a powder with one ingredient: kale. 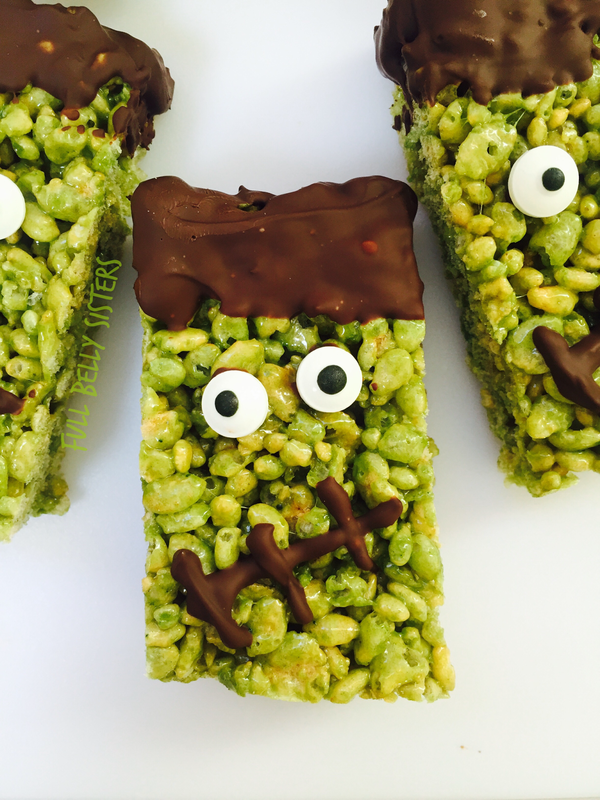 Much better than adding artificial green food coloring to these adorable Frankenstein treats, right? You can order it right through their site. Some notes about my ingredients: (1) I used a rice cereal with no artificial colors or preservatives. (2) I couldn't find candy eyeballs without artificial colors, so these are the one ingredient here that is not naturally-colored; maybe next time I'd do an inverted white chocolate chip and just put a dot of dark chocolate for the pupil. (3) The original recipe calls for chocolate candy melts, but I never use them because they're full of partially hydrogenated oils. 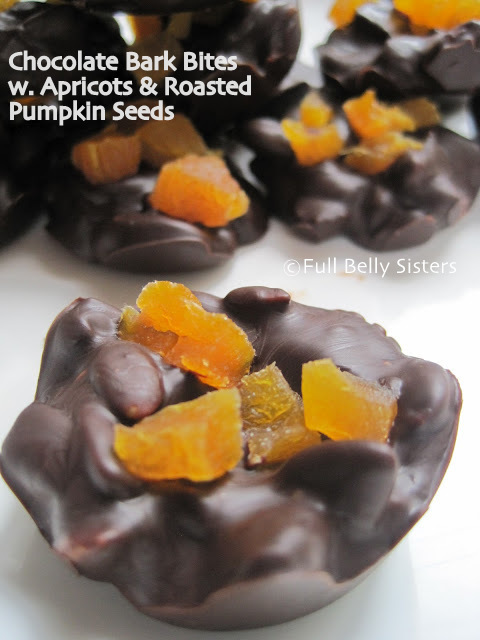 So, I dipped my treats in the Divine 70% Dark Chocolate that I received for my #Choctoberfest recipes. The bonus is that dark chocolate—like the kale powder—adds actual nutrition to this dessert! See? I really am that mom. Grease a jelly roll pan or large cookie sheet with butter (or you can use a cooking spray). Line two additional sheets with parchment paper. In a large pot, melt butter over low heat, then add marshmallows and stir until fully melted. Remove from the heat. Add in the vanilla and fujiKale and stir until smooth; quickly add the cereal and stir until it is fully coated in the marshmallow mixture. Press the cereal mixture into the greased pan; you can use a buttered spatula or, as I do, take one of the sheets of parchment, place it over the cereal, and just press with your hands. Let it cool. Once cooled, cut the crispy treats into small rectangles about 2" wide by 3" long. Melt the dark chocolate in the microwave or double boiler until smooth and glossy. Dip the top of each rectangle into the chocolate (this is Frankenstein's hair) and then place onto a parchment-covered pan. Then pipe the melted chocolate to create Frankenstein's face: I just used a little baggie and cut a tiny hole at the tip, then piped two dots for his eyes and a jagged chocolate mouth. Stick two candy eyes on each chocolate dot. Chill the treats in the refrigerator until the chocolate has hardened. 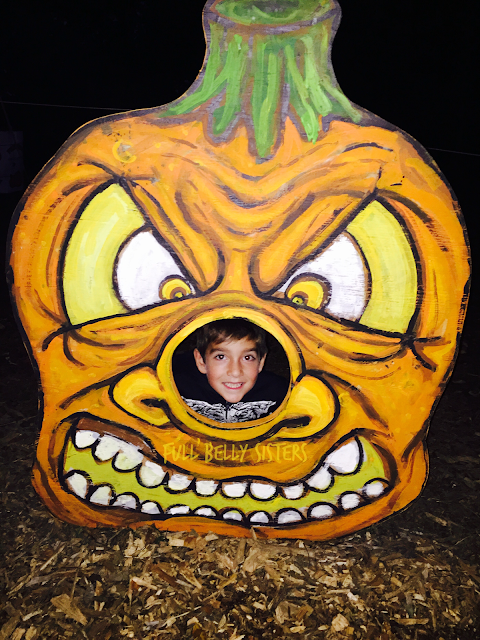 These were a crazy, huge hit with my son and his buddy. They just thought it was SO COOL. Every night at bedtime, my son says one thing that he appreciated about the day. Tonight he said, "I appreciate that you made me those really yummy Frankensteins." I love being that mom to this son. Happy Halloween, friends! If you try this recipe let me know what you think! Leave a comment on this post—and don’t forget to take a picture and share it on my Facebook page or tag it #fullbellysisters on Instagram! How fun and creative, love these! This is my first sighting on the Kale powder. I'm definitely going to search for it - I like hiding something healthy whenever I can. This is genius. What an adorable Halloween treat!! Definitely check out the fujiKale, it works great! 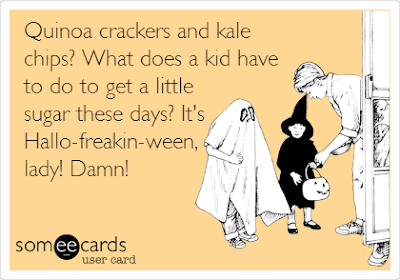 A delicious Halloween treat, I love the Kale powder idea. I'll be searching for it for sure. You are amazing, these are just too cute! Healthy to boot? You ROCK!! So freaking cute! And a hidden healthy ingredient! Count me in! Do you think I can get my husband to eat these too? hee hee I've never heard of that Kale powder before, nut will be on the lookout for it! If a bunch of kids ages 7 and under loved them, so will your husband! This are adorable! Love cute Halloween treats like this. Love the superfood ingredient too! These are adorable and I loved the graphic in the post! LOL. What a fun recipe! I love how creative everyone is getting this Halloween, but this is one of my favourites. These look so cute and my kids love rice krispies so they will totally love these! These are too freakin' cute! What a super cute idea for the kiddos and loving that hidden secret ingredient! What a fantastic idea! My kids would love these, kale or no! Loving the sound of that fujikale too! I don't know which one to do, laugh or be scared lol! They are so funny! Hehe, these make me smile, plus they look yummy! I love the sneaky way you hid something healthy in there! Thanks, they sure were a hit here! these are the cutest treats! will have to keep them in mind for next halloween! These look delicious and fun to eat. This is adorable! I love that they have a sneaky ingredient as well. This is a very very creative idea. I will try it next year for Halloween. Great, hope you enjoy them as much as we did! These are so cute! I wish I would have made these for Halloeen! Definitely sounds like a treat I could totally get away with putting kale in. I bet the kids would never even think there was something healthy in these. luckily this kind of stuff goes over well in my house all the time. Yummy, I would really like to try those. Kale are no Kale, these are just too cute and look yummy! These are adorable!! My nephew is currently obsessed with Frankenstein and would love these! I love the fact that they are healthy! Totally need to try these! Thank you!! These were a huge hit today! Thanks!